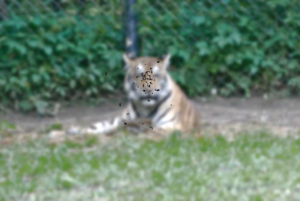 Human’s fixation points from Judd’s eyetracking study (black dots). 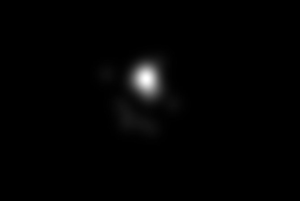 Saliency map generated from these fixation points. 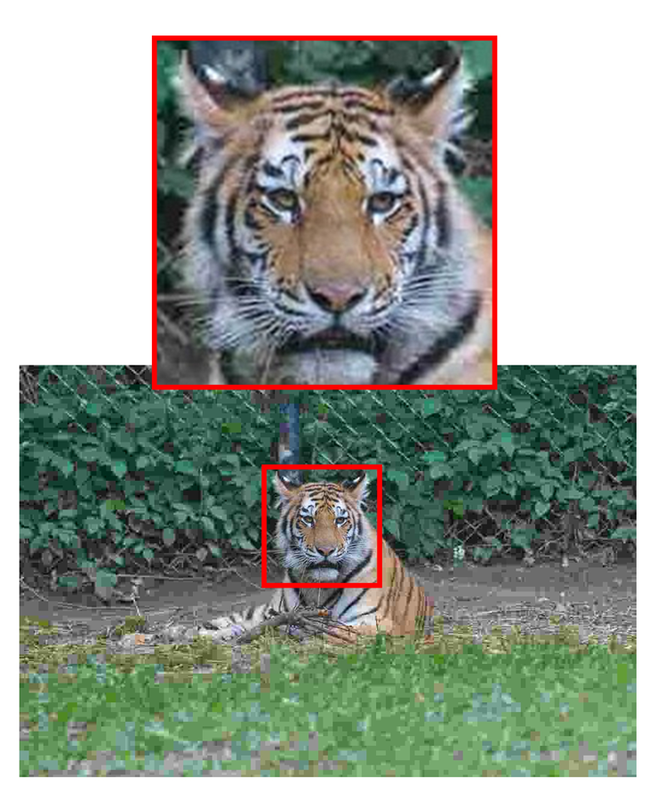 Firstly, I developed a bi-level saliency-based image compression based on foreground/background image segmentation. However, this approach has discontinuous visual quality at borders between foreground and background blocks. 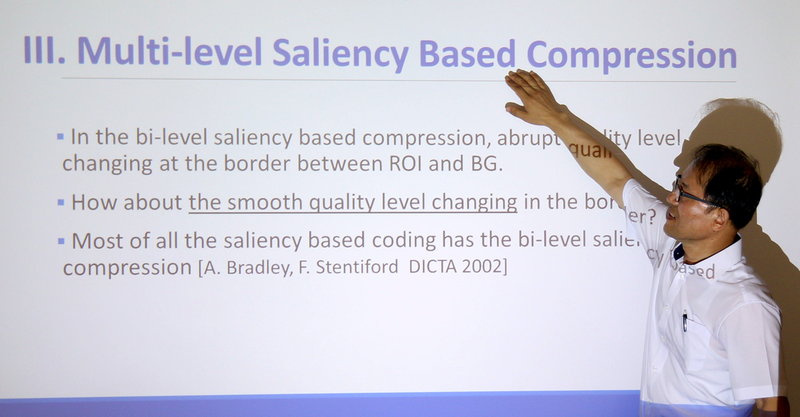 Secondly, in a multi-level saliency based approach, the bitrate is adapted block-wise and offers smooth visual quality. 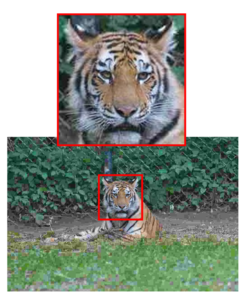 In order to evaluate the proposed methods by subjective image quality assessment, a very large crowdsourcing study using pairwise comparisons was performed. The results show a significant improvement of subjective visual quality. A JPEG image at 0.2 bits per pixel. Proposed-visual quality enhancement on the saliency blocks at the same bitrate. Source: © Ryan Poplin, license https://creativecommons.org/licenses/by-sa/4.0/, taken from database of Judd et al “Learning to predict where humans look.”, changes and enlargement of detail by Sung-Hwan Jung. My talk at the University of Konstanz. On 12th of July I presented my research in a talk at the University of Konstanz after I spent a sabattical year as a visiting scholar at the SFB-TRR 161. 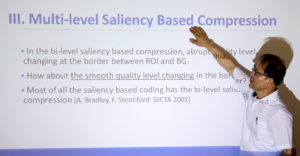 During my research stay I was part of project A05 and of the Multimedia Signal Processing Group of Prof. Dietmar Saupe, where I was involved on the subject of “Saliency based color image compression and evaluation”. Professor of Computer Engineering at Changwon National University in Korea. He has international visiting research experience in some universities such as University of California at Santa Barbara (UCSB), Colorado School of Mine (CSM), and University of Missouri at Kansas City (UMKC). His research interests include visual quality assessment, content-based image retrieval, steganography, watermarking, internet-based remote monitoring, medical image processing, computer vision and pattern recognition, etc.